Sun Garden is a leading European parasol, furniture and outdoor co-ordinates brands, available now in Australia. The 'Mercedes Benz' of garden umbrellas, the Sun Garden range of cantilevered parasols, designed and manufactured in Germany, is renowned for its quality materials, smooth operation and ability to offer shade irrespective of the position of the sun. Modern, attractive colours and designs not only reflect current trends, but also set styles and expressive accents that are as long-lasting as their superior materials and workmanship. They are also suitable for commercial areas. Sun Garden cantilevered parasol designs are suitable for any outdoor deck, courtyard or garden, measuring 3.5 meters in diameter. Perfect for summer, they offer style and elegance and are sure to be a conversation piece in your outdoor living area. The parasols are free-standing, cantilevered from a robust stand, sitting on a frame of strong aluminium tubing. Conveniently open and close the parasol with its easy-to-use hand-crank mechanism, and a 360˚ locking mechanism allows it to be safely positioned at any angle to provide all-day shade, irrespective of the angle of the sun. Their extremely sturdy base, when filled with water or sand, ensures it remains stable and safe. The parasols use a polypropylene canopy. A hard-wearing material, characterized by its high durability and colour fastness, makes Sun Garden parasols long-lasting in Australian conditions under the harsh tropical sun. Master Distributors is the exclusive distributor of Sun Garden products in Australia and New Zealand. 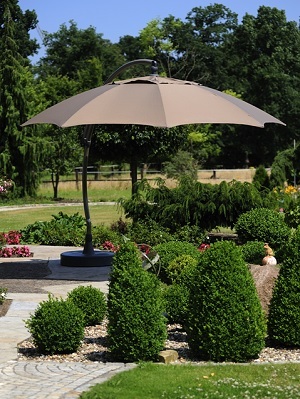 See our Special Offer to save 35% on Sun Garden parasols! Find out more by visiting the Sun Garden website or call Master Distributors on 03-9538-9200.